Makes 35-40 ovals. I like to serve 2 per person. 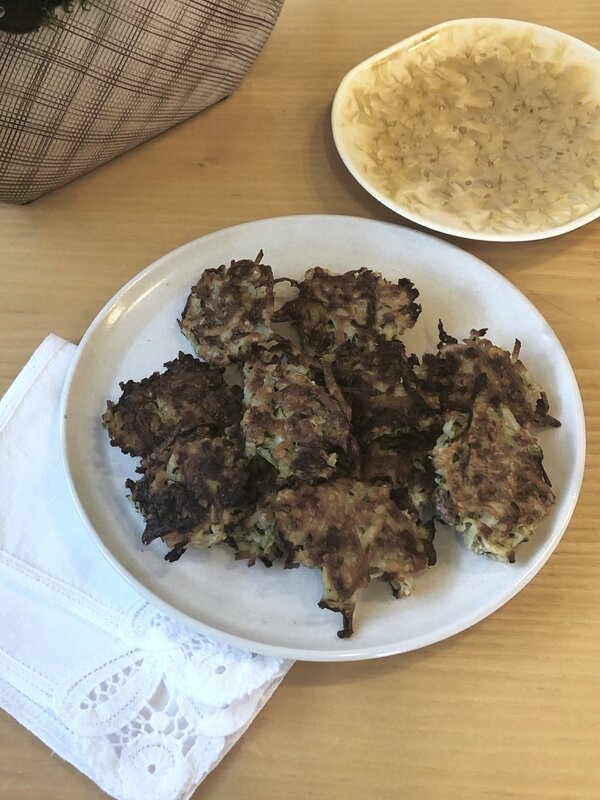 Gefilte fish is the most representative of Jewish dishes and is typically served as a first course on the Sabbath and holiday meals. It is a bit time consuming to make gefilte fish, but very satisfying. The ovals in this recipe are soft, pale and well-seasoned. Make it at least a day ahead to allow the sauce to jell. I love serving the fish with freshly grated horseradish. A slightly different version of this recipe first appeared in my cookbook, Helen Nash's New Kosher Cuisine. Have the fishmonger, bone, fillet the fish and grind them both together to obtain a very smooth texture. You should have 3 pounds of ground fish. Save all the trimmings, head, bones and skin for the stock (you may want to ask for more trimmings from only white fish varieties). Place the ground fish in an electric mixer bowl. Add onions, eggs, sugar, salt and pepper. Mix with the dough hook, at low speed, adding the bubbly water very, very slowly. Be patient. Season to taste and refrigerate while you are cooking and straining the stock. I suggest that you use an 11x16 enameled oval pan with a lid to fit the fish in a single layer. Place the fish trimmings in the pan with the onions, carrot, salt, sugar, peppercorns and 7 cups of cold water. Bring to a boil over high heat, then lower the heat and simmer covered for 75 minutes. Cool the stock a bit. Wet a triple layer of paper towels with cold water and squeeze almost dry. Line a strainer with the towels. Place the strainer over a bowl and ladle the soup with the trimmings in it. Squeeze the towel with the trimmings in order to obtain all the liquid and flavor. You will have to change the towels several time. Rinse the saucepan and return the stock to it. Add onions, carrots and seasoning to the stock and bring to a gentle boil. With an oval (No 30) ice cream scooper, form flat ovals and drop them into the simmering stock. From time to time, wet the ice cream scooper in cold water. Bring slowly to a boil and simmer covered for 75 minutes. Shake the pan from time to time and turn the ovals. Peel the horseradish root, cut into very small cubes and chop finely in a food processor fitted with the steel blade. Add lemon juice to keep it from darkening. Store right away in a tight fitting container. Either the fishmonger can grate the onion for you finely or you can do it in the food processor fitted with the steel blade.